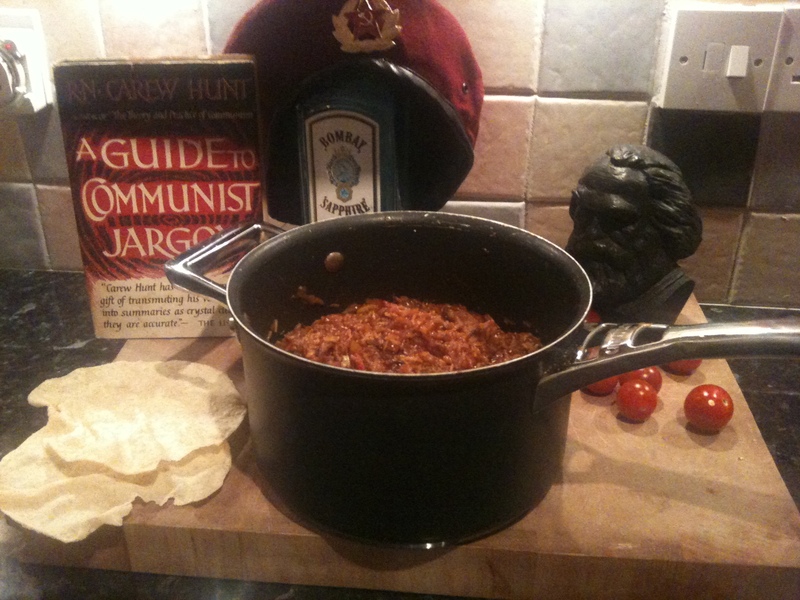 Multi-pot curries are bourgeois. Free your meal from an elitist saucepan hegemony, and save time on washing up. Win-win. Take one large heavy-based pot and prepare it for some thoroughly dignified labour. Fry the onion, garlic, and chilli in plenty of oil, until the onion is translucent. Add the powders and the mushrooms, and fry some more, until the air of your kitchen is thick with spicy fog. Add the lamb and the rice, and stir vigorously. Add the tomatoes, chutney and stock. Put a lid on the pan, and leave to simmer, stirring occasionally, until the rice is cooked, or the proletariat unites and throws off the yoke of the bourgeoisie – whichever comes first.